Adding a science stand to your event is the perfect way to encourage people to attend as well as being a great talking point for after the event! 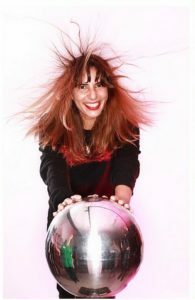 Book one of our scientists to liven up your evening with balls that flash when everyone holds hands, static sticks that make objects levitate, a plasma ball that can make a bulb light up in your guests hands and of course the Van de Graaff generator for hair raising fun and some brilliant photo opportunities! Fun Science is available for all family events, corporate workshops and team building, weddings, shows, festivals and anywhere that needs a touch of science! All bookings are managed through our head office and we cover all these areas so send us an email at info@fun-science.org.uk or give us a call on 07708 214840 to find out how we can add a spark to your event! Previous clients include Camp Bestival; Bath Taps Into Science; Wonderfields Festival; Wiltshire Music Centre; Butlins; Merlin Entertainments; Manchester United; The Galleries Bristol; Kelloggs and Waitrose.